Here is the video, https://www.youtube.com/watch?v=uRcLl9DnZnM Sorry for the poor quality, It was shot with my mobile camera. Let me know what you guys feel. Appreciate the video, Dev. You did a great job. From the video I would suspect PMV. Didn't you also mention when he is startled he will go into one of his spasms? Poor Birdie! He's definitely suffering from the type of neurological disorder commonly associated with PMV (but whether it is PMV cannot be known for sure without a virus test). With tender loving care the symptoms will ease out with time, as he puts on weight and his immune system gets stronger. You may want to compare your video to this one of Sammy's. At present she is better than that, but it's been a very slow progress. You are exactly right, Teresa. I agree with Cindy and Teresa, Dev. I do suspect Birdie has a virus that has affected his brain. He does look better from when Priya rescued him but improvement sure has been long. @Teresa, Thanks for sharing the video, it looks exactly the same Sending my prayers to Sammy. This poor birdie didn't even have the strength to stand up when we found him. But now he can walk a bit and tries to run away when I go near him. @Charis, I agree with you guys. Just praying all the time that everything goes well. Thanks for all the help and support Can't imagine what we would have done without all your support. Teresa, glad to hear that Sammy is doing better now. How long did it take for her to reach the stage of improvement? Can she eat/drink on her own? Can these birds ever fly? Our Pij would have severe seizures without any warning. It's possible they experience some degree of pain when this happens as their muscles get very rigid. At least Pij's used to. I would compare it to us tensing up some of our muscles in ways we don't normally do. After a while of that on a near continuous basis our muscles would begin to ache. I believe the same would happen to pigeons. There was a statement made (not here on PA ) during a discussion of a pigeon who sustained a severe injury and/or illness and some were concerned that he was in pain. This is the statement directed to those of use who were concerned. "For those of you who look at the bird and always see "IT'S IN PAIN!!! ", just let it go..you're probably in a lot more pain looking at the bird that it actually is.."
Initially I was saddend to read that statement. Then the saddness turned in to rage. The only thing I could think of at the time was that some people must figure pigeons don't feel pain because they don't shed tears or cry out, which is completely insane to me. 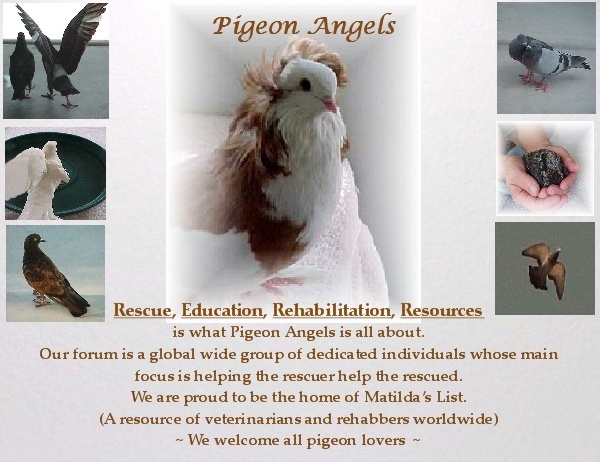 The person who made that statement, btw, is supposed to be very familiar with severely injured pigeons. Got me angry too reading that statement It is akin to a pigeon thinking that a human is comfortable after breaking all his bones, just because it doesn't understand our language or expressions to depict pain. I feel such people are insensitive to the needs and pain of other people and creatures. They go about their job mechanically, even if it is to treat an injured bird or animal. Sick. I agree with you Priya. Insensitive is the exact word I was looking for when attempting to describe the statement that was made. For some reason, it just wouldn't come to mind. I agree with you guys. Just because birds and animal do not shed tears, or these poor birds who do not even make any crying sound most of the humans assume that they are not undergoing any pain Its too hard to making such people realize their mistakes. I wish they all change. Its too hard to making such people realize their mistakes. I wish they all change. Naturally I agree with you all -- every creature who has a nervous system can feel pain, and it's just downright idiotic for anyone to say the contrary! Having said that, I spoke to my vet about Sammy's seizures, and apparently they resemble epilepsy in people. If that's the case, birds with seizures will certainly have sore muscles afterwards, but thankfully thay may not be in pain during the seizure itself. I had an epileptic flatmate for a while, and although she felt dizzy, tired and a bit nauseous after a fit, she told me she felt nothing during, it was like she had fainted, though her muscles twitched and her eyes were open. I hope this helps and puts your mind at rest a little. If it is PMV, after about 6 weeks the birds stop shedding the virus, and after the second bath there will be none left on the feathers either. 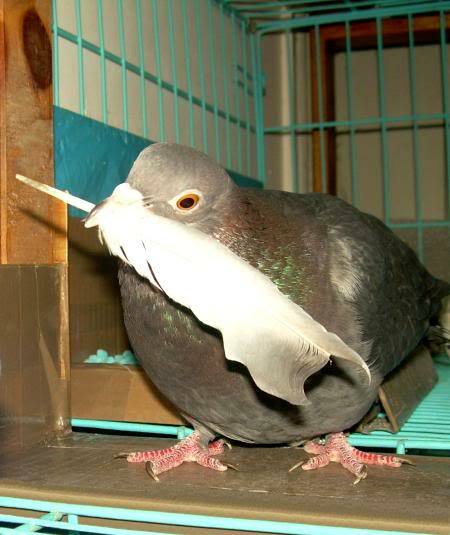 At that point there is no more danger of contagion, and they can share living quarters with other pigeons. Mind you, gentle pigeons only, otherwise they will peck the convalescent bird. Some birds stop having most of the symptoms after 6 weeks (like Plamen's) but others continue to show them for much longer. A few will always have one or more symptoms. Plamen doesn't release his after they recover, as he says there's always a chance a seizure would be triggered if they are startled by a cat, a dog or a car -- and he won't gamble on the consequences. On the other hand, Petra has successfully managed to release most of hers, once she was confident they were strong enough and flying well. My Sammy is definitely a keeper! She was unable to feed herself for 7 months, though she could drink by herself. Now she can do everything other pigeons do (including having a mate and laying eggs) except that her flying skills are appaling! She takes off in a spiral, gets 2 feet off the ground, and comes back down in a spiral again, often landing awkwardly. Nonetheless, she looks all proud of her achievement, straightening up immediately and strutting her stuff across the room, pleased as punch! It's been a learning curve with this one... and the golden lesson I gained from it was 'never give up'! Very important: birds with seizures can drown very easily in their drinking water or in the bath. At bath time we must be beside them, to help support them and be ready to lift them out of the water if needed. And drinking vessels should be deep and narrow, too narrow for them to get their head inside it, just the beak. I hope Birdie starts to relax more around you. It's hard for an adult feral to feel comfortable in the presence of humans, but with time and patience a lot can be achieved. Suspicious birds can sometimes be won over (or at least they become intrigued, rather than antagonic) if you make interesting sounds at them, like imitating bird song, or singing to them. Try that if you like, our reputations have nothing to lose from it, as we already are and proud of it! "we already are and proud of it!" Though Birdie still has a long way to go, i am pretty nervous about the thought of releasing him, even if he completely recovers. As you mentioned about Plamen, the chances of a relapse is high if they are stressed or startled or cannot find proper source of food/water. I would definitely want Dev to keep him along with Mito and Sia, though how feasible it would be for him and the logistics is for him to decide as space is a major constraint :(. I am sure he feels as strongly about keeping Birdie as i do :) Let's see what happens....still a long way to go before Birdie gets better. I loved the idea of singing to them Dev should try it Yes we all are after all! I'm glad my post helped, Priya! I totally understand the difficulties of trying to help all the birds that need us when space is limited and there's nobody near who can give them a permanent home or even babysit them for you. My home is slowly but surely turning into an aviary, and my dining room is more often occupied by cats then by people. All we can do is do our best and take one day at a time. Sammy is very much a part of the family. She's very confident, curious and demanding, and seeing her enjoying life I feel deep down inside that it was right to nurse her through all the bad times, that she didn't find the experience traumatising. And if it's good enough for her, it's good enough for me! I remember reading a very moving message from a Pakistani member in another forum. Sammy is such a sweetie. Dev and Priya, Teresa has said everything but I also want to emphasize that the seizures of a sick bird are terribly to look at and I can tell you that I was more than once in tears but I don't think that the birds feel pain at that moment. There is rather the danger of injuring themselves when they have these cramps. I often took Pina - she was the one with the worst seizures - wrapped her up and carried her with me around, softly talking to her until she found her peace again. She was even worse than your bird and worse than Teresa's Sammy. She made awful tumbles in the box, was rolling her eyes and absolutely lost direction. So I rather put her into her box, which I had patted with a lot of stuff so that she could not bang her head. The danger that they try to fly on some object and then fall down is also present - so it is better to keep them in a well confined space. Before I let the birds free I tested them and watched them closely. But somehow I always knew when they were ready to go. 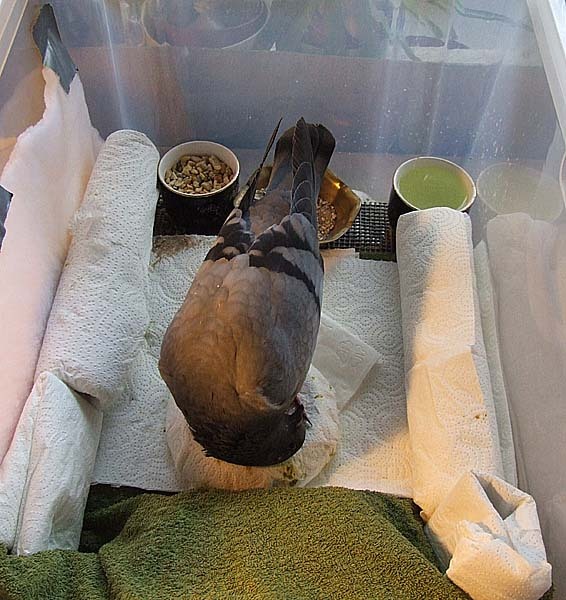 Besides Pina's current health problems there are no symptoms on any of the birds and they all enjoy good health. Thank you Teresa and Petra for sharing your thoughts on how to take care of such birds It was much needed and also helped us by giving confidence that Birdie may eventually recover one day. Petra i agree with you, poor Pina underwent a lot. From the posts i followed about her, she definitely seemed to be suffering a lot more than poor Sammy and Birdie And as you said out of total 11 months in her life, she was ill for 9 months and she is still battling it out :( I'm following the other thread on her, but i'm sure Pina will again bounce back as she is a brave little sweet pidgie Bless her little heart! Teresa, Sammy is too cute! i just loved that video...she indeed looks like she is contemplating where to peck the cam she is such a sweetheart! And i loved that saying too! So Dev has decided to keep him in a cage lined with lots of papers and towels so that he doesn't try to fly and doesn't hurt himself when he gets fits. The easiest way to pad the walls and bottom of a cage, is to cut panels of soft cardboard, cover them with plastic (for waterproofing and ease of cleaning) and secure them in place with tape or with string threaded through small holes at the corners of the panels. Then, instead of having to change/adjust the padding, you only need a quick wipe and a change of newspapers! That's cool Thanks Teresa! didn't strike me earlier. Will definitely do it like what you've mentioned...makes cleaning up a lot easier! They do love the feathers, don't they? Dolly is obsessed with them.